If you’re a bit disorganised, there are plenty of calendar apps, to-do list apps, reminder apps and alarm clock apps to sort your life out a little. But, Bounce kinda combines everything together (your location, appointments, traffic info and all kinds of other data) to make sure you’re always in the right place at the right time. Or that’s the theory anyway. 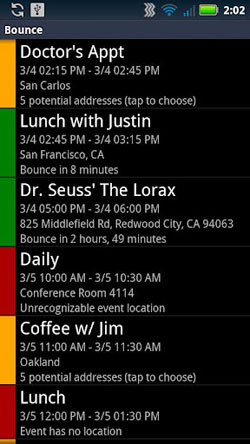 The Android application works with your Google Calendar appointments and Microsoft Exchange and lets you know when you need to leave to get to where you need to be. You can tweak the settings a little if you need to get a coffee on the way, or find a place to park so your travel time will be accurate. Bounce is only in Beta right now and available for Android devices over on the newly named Google Play, but expect an iPhone version to be rolled out in the coming months.